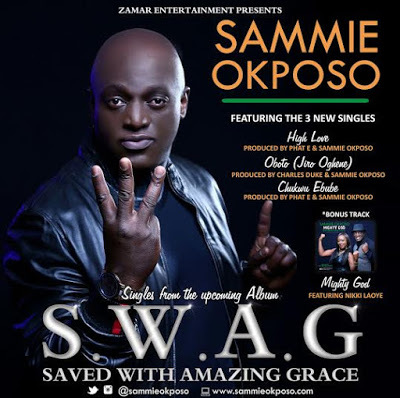 From the stables of Zamar Entertainment comes three new exceptional singles by Multiple Award winning Recording Artist and GLO Ambassador, Sammie Okposo. The singles are from the much anticipated upcoming album, S.W.A.G (Saved With Amazing Grace) which will be released later this year. After the recent release of the trending collaboration, Mighty God, with award winning singer,Nikki Laoye, Sammie Okposo takes it a notch higher with the catchy collection of high praise in three different flavors as he creatively expresses his love and adoration for God in an unforgettable flow. A must-have indeed on your playlist, you are bound to have each song on repeat. And hey, Keep your calendars open, everyone!! The Sammie Okposo Praise Party Global Tour #SOPP is heading out soon to UK, USA, Canada and more cities worldwide. Watch out for a city near you. Listen, Download and Enjoy the three new singles and in case you missed it, the bonus track, Mighty God featuring Nikki Laoye.